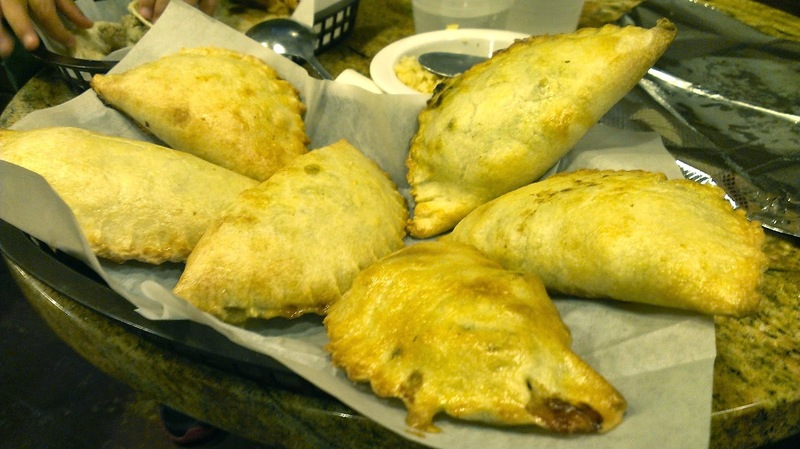 The empanada has many names and variants. It seems like just about every country or culture has its own version of baked or fried dough filled with any number of combinations of proteins and/ or veggies. In fact, Wikipedia list 35 countries under its "Empanada" entry-- from Afghanistan to the Philippines and just about every South and Central American nation as well. But curiously, while Wikipedia describes just about every regional empanada variety in some amount of detail it fails to give much description to the United Kingdom's version, the Pasty. In fact, it links out to a separate entry, where it is not described as an alternate form of empanada (I know they are different, keeping reading to find out how), but rather as a "semicircular food item". Now I am all for simple and straightforward descriptions of the places I eat and the things I eat in those places, but even to me "semicircular food item" does not sound the least bit appetizing. That being said, baked dough stuffed with meat is very hard to mess up (although if anyone could make it bad it would be the English), and now in Denver there are at least two places where one can sample what is probably the UK's best-known food contribution to the world after Fish and Chips. Everything I hate about driving and suburbs and traffic is summed up by the intersection of Parker and I-225, so for this reason it probably took us so long to actually go check out Los Pastes. By the time I did wrestle my way in there at about 6pm on a weekday (and after missing my turn once), my boys had learned two new words that they are not allowed to repeat in public, and I was more than ready to unwind with some hot meat in a steamy bun (somehow that sounds wrong, but it couldn't have been truer). 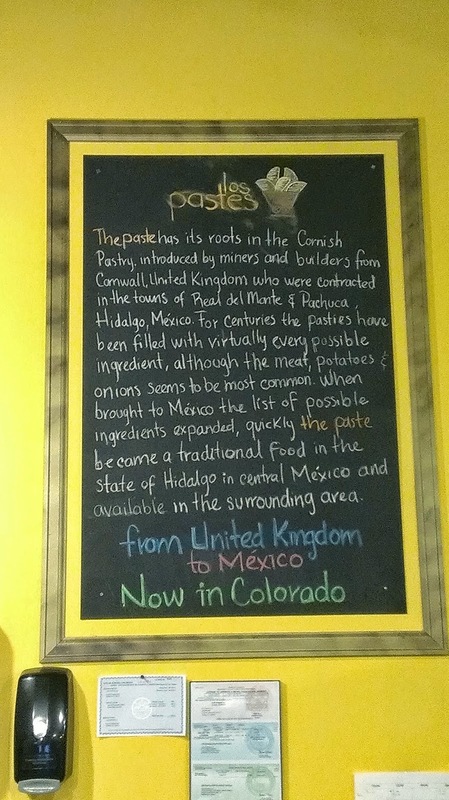 Los Pastes explains in detail the history of Cornish miners introducing their Mexican compadres of Hidalgo to what the Cornish called a Pasty. Of course, they are pretty much the same thing, and Mexicans just sort of rolled with it as they had been eating empanadas well before those English miners came over-- though there is one important distinction to be made: the ingredients of a pasty are folded into their dough raw, where Mexican empanada fillings are often pre-cooked or at least partially cooked. Of course, in the end (as foods and cultures all over the world tend to do) the Mexicans changed the spelling to "Paste" (pah-steh) and filled them with more Mexican-born ingredients. And of course at Los Pastes this is what you get (though I pretty sure the ingredients are pre-cooked). There is a modest selection of pastes to be had at Los Pastes, and most are pretty good. In general they lack the refinement of a place like Maria Empanada, or the flavor and satisfaction of Buenos Aires Grill or Empanada Express. For example, El Norteno (steak, green pepper, onion) was under-seasoned and the meat was chewy (maybe a shout out to the English); and El Hawaiiano was just a little silly. Both, however, were saved by the insanely good and wonderfully spicy red and green table salsas. In fact, these salsas alone would give you faith in the skills of the culinary minds behind Los Pastes, even if all the fillings were not quite there. 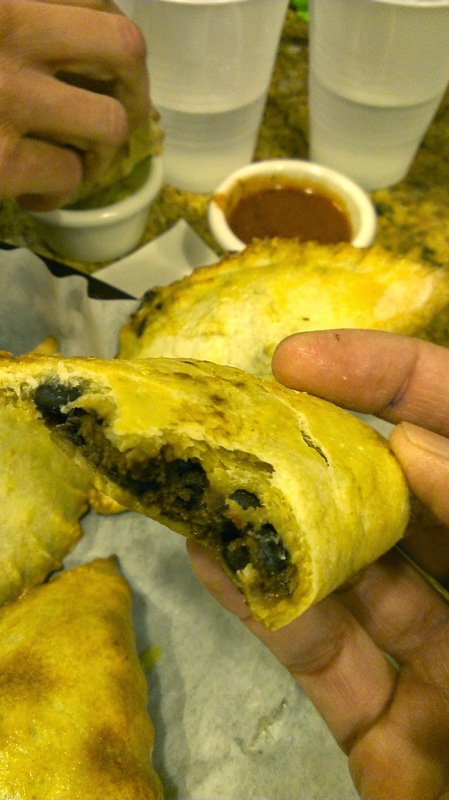 On the other hand there are some rather good empanadas-- I mean pastes-- like the dark mole-filled chicken one, the Veggie (potatoes, peas, onions and oregano), and El Minero (potato, beef and onion). Also the dessert versions were all great, but especially memorable were the guayaba with cheese and the arroz con leche. Way across town, a month or so later I stumbled upon The Pasty Republic. Located in the hip-and-getting-hipper Tennyson St in Berkley Park, The Pasty Republic is quite different in more than just location than Los Pastes. 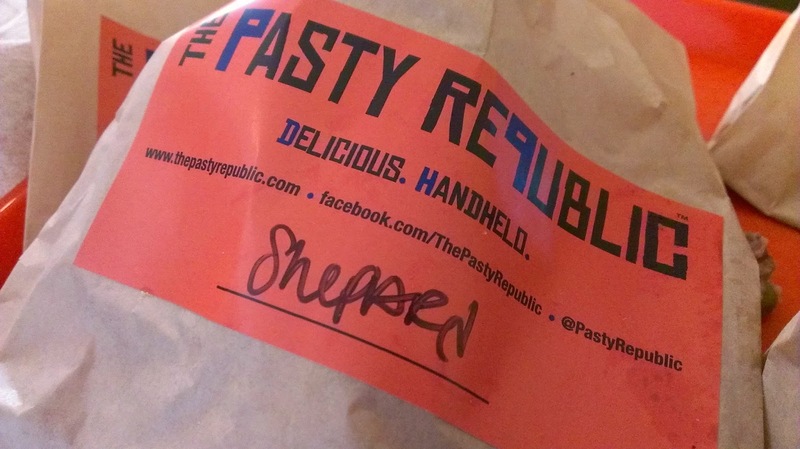 The Pasty Republic, as the name implies, slings the British original, though purports a modern twist to these handheld classics. I think when I went to Pasty Republic it hadn't been open all that long. I know it can take a few weeks --or even months-- for a restaurant to get rolling, but I hate to say that I didn't like any of the savory pies we tried: a Miner, a Shepard's pie and a chicken pot pie. Each was enormous and piping hot. Each seemed like it would be a wonderful hearty meal-- juicy meats and well-seasoned veggies-- like a nice comforting stew in a buttery, fluffy pastry. Unfortunately, it ended up being much more of a "semicircular food item". One was so undercooked I even threw it out. We didn't leave entirely disappointed as we finished with the Nutella-orange pasty, which in itself is worth making it back for. 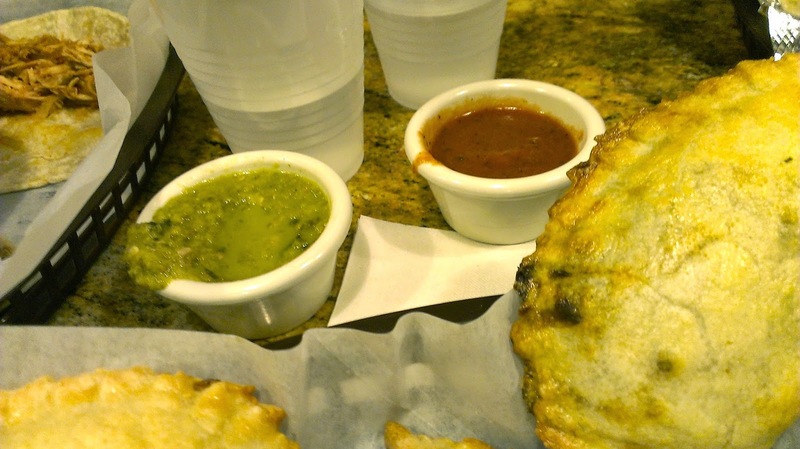 I don't think you should take my single visit as a reason not to go try The Republic for yourself, but in the end, in this comparison of Denver's Pasty and Paste, there is no question that the Mexican version is better. I'm pretty sure that mixing any cuisine with English cuisine makes it a little worse--and likewise, adding a little Mexican flavor to anything is sure to make it better. So while I might have been at the Pasty Republic on an off-night or too early on, if I'm in the mood for a Cornish-inspired empanada, I'll probably stick with a Paste.